“For the evaders, avoiders, dodgers, and side-steppers. You probably have a good reason for hiding. 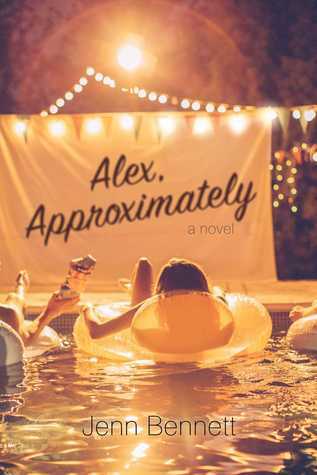 An undeniably adorable YA romance novel, Jenn Bennett’s Alex, Approximately is the perfect read to rekindle those “gushy” feelings of passion and young love. When Bailey moves to California for a fresh start, she begins her ultimate plan – to find her online soulmate “Alex” before the summer ends. But when she begins a “love-hate” entanglement with the gorgeous yet irritating “security-surfer boy” Porter Roth, things grow more complicated than she anticipated. A breezy summer read full of laughter and awe, Bennett’s standalone novel makes the thought of love so much more beautiful than it already is. If the first novel of the year is supposed to reflect the rest of the years reading experience, I’m in for a treat. Being the first novel I’ve read by Bennett, I’m rather eager to find more books by this author. The story’s simplistic yet full of charm, with a wonderful amount of romance yet a dash of danger. CONTENT & TRIGGER WARNING: This book contains death, drug abuse, moderate sexual themes, violence and some crude language. Bailey Rydell’s an absolutely amazing main character and narrator, making the book very difficult to put down. She’s an introverted and “closed off” (for very good reasons) individual with a great amount of wit and comical points on life; this character type relates to me quite well, making this even more enjoyable. Bailey isn’t perfect, which is shown through her struggles to open up and to maintain healthy relationships with friends and lovers; but her character grows throughout the story and owns up to her mistakes. The narration style is supposed to reflect her mental thoughts — which Bennett does TREMENDOUSLY! Be prepared for a number of outburst laughter sessions, especially with Bailey’s sarcastic and witty humour narrating the tale. The familial bonds for a number of characters in this novel are goals. It grows tiresome reading novels that always dictate harsh family connections. Bailey and her mom aren’t doing the best, but her connection with her dad is remarkable. He’s understanding and respects her boundaries, as Bailey also learns to trust him more and has so much love for him. A number of other characters presented in the story also demonstrate strong familial ties, such as Porter Roth and Grace. This positive light on family is a breath of fresh air. Though not overly complicated, Bennett writes a well-paced story and gradually introduces key pivotal points. During my read, I never felt as though the story rushed from one section to the next. In addition, the smaller details of Bailey and Porter’s pasts aren’t THRUST upon the reader; Bennett holds the suspense and drops bits of the background stories until eventually divulging at appropriate times throughout the novel. There was never an “information overload” point in the novel (thank gosh). Bennett addresses a number of topics that are more difficult to discuss, making this novel more than a romance story. From drug abuse to the loss of a loved one, the characters experience both “relatable” and “less common” topics. It’s all these different struggles each character faces that really made the story more intricate and special, providing a read that’s more than a love story. These events also provide reasons for how characters act and how they eventually overcome them. Not all of the characters do by the end of the novel, but I find this more realistic if anything. Though Bennett discusses in great detail some important issues for each character, she leaves readers hanging with some by the end. This made me a little disappointed by the end, for it felt as though Bennett either forgot about these characters or didn’t find them as important. Though Bailey and Porter are the main characters, it’s important to reflect back upon topics discussed earlier. For those of you who dislike predictable stories, this may be somewhat of a disappointment. Honestly, this wasn’t a HUGE issue for me — I wasn’t looking for this “mystery romance” story, but rather a light read that made me happy by the end. However, the plots eventual ending is EXCRUCIATINGLY obvious; I thought Bennett did this deliberately, but some other readers found this annoying. The “instalove” and Porter’s unrealistic expectations of Bailey made me rather frustrated. Without spoiling too much, Bailey goes through an EXTREMELY traumatic experience a couple years prior to her moving to California. Porter wants her to “open up” more, which I totally understand…but they barely know each other. As someone who takes a while to grow comfortable with someone, this was a BIG turn off for me. Give my Bailey girl a break! Even though many people are a fan of the “loving bully” trope, I’ve grown tired of it. Personally, I don’t believe we should be teaching young woman the saying ‘when a boy picks on you, he likes you’ — seriously, how about no? There’s fun banter and teasing, and then there’s being downright rude. Though I grow to like Porter, I found his teasing began as bullying first. Thank gosh he takes a different turn early on in the plot, since I would’ve DNF’d this baby REAL quick. Some might think I’m sensitive — I think I just like a man with class. And THIS is coming from the person who’s favourite TV character is Chandler Bing…the BEST sarcastic yet adorable character on television ever! Alex, Approximately is a heart warming YA novel that’s sure to bring readers those “butterfly” feelings by the end of the novel. The characters are lovable and the story is both simplistic yet has some layers of depth to it. Yes, the “loving bully” trope grinds my gears, but Bennett’s lovable male lead takes a quick turnaround in the plot — and Bailey just too adorable to NOT read about! Looking for a funny and loving story with a little bit of that extra something? Look no further. Thank you, love! I feel the same – if the bullying trope continued for any longer, I probably would’ve DNF’d it. But it didn’t last too long…and I just love Bailey!! Her character is lovely and so full of depth! Thank you!! That means a lot! I always feel as though I just ramble a lot ha-ha! I want to try shortening them this year…but I have so much to say!! Thank you again for the compliment! I love your reviews as well! They seem more put together than mine lmao! Love the sound of the family dynamic in this!! And it’s great the mc was so good as well. Fair about this being predictable and not being into the loving the bully trope. It does sound good overall though. Great review! Bailey and her dad are adorable! Even when she messes up and he learns that Bailey has been lying, he doesn’t get mad. He completely understands and is loving…I just LOVE their connection! great review! I don’t mind a predicable romance occasionally.. guess it depends on my mood?? However totally agree about the lovable bully thing being over played whatever happened to just being nice! Thank you! I don’t either but I thought it best to still point out – some people were REALLY put off by it, but I wasn’t really expecting it to be UNPREDICTABLE. And I know eh??! Honestly…drives me nutty!! !